It has served the Festus area since 2004 and it is owned by Doug Rademaker (R.Ph.) and Jeffrey Elbl (Pharm D). Both these individuals have a reputable number of years of experience in the practice of pharmacy and working together they aim to provide individuals residing in the Jefferson County expert care and optimal medical therapy designed to meet the needs of patients in the community. Prescriptions Plus Pharmacy claims to offer a number of services including selling different medications like those used in treating pain, pills for cold and allergy, vitamins and supplements, oral health products and first aid items. They also provide home decor items, greeting cards, items for special occasions, candles and gift cards. When patients who live within 15 miles of the location of this pharmacy purchase any item, they are guaranteed home delivery service for a fee of $5. Private consultation services where patients can speak with a pharmacist if they have questions about a medication is also allowed. Other important services carried out by this pharmacy include medication synchronization which is a program designed to assist patients to keep up with medication refills and medication pickup so that patients can pick up all medications on a single day of the month. The pharmacy also ensures the provision of durable medical equipment including orthopedic supplies, bathroom equipment, nebulizers and equipment that aid motility. Medicare open enrolment and vaccinations for flu, shingles, measles, pneumococcal and Tetanus, diphtheria and pertussis (Tdap) can also be done easily at Prescriptions Plus Pharmacy. Claudia Fields-Mullins, a customer using this pharmacy stated that Prescriptions Plus Pharmacy is her favorite pharmacy and this was mainly due to the excellent services she received here. She compared the treatment she got with other pharmacies and concluded that the staff in Prescriptions Plus Pharmacy are not deceitful but are always nice, polite and compassionate when dealing with customers. Daniel Muller who has also used Prescriptions Plus Pharmacy was full of praises for the prompt, professional and courteous services he received. He even stated that there has never been a mistake and that he would not go anywhere else. Cassandra Scherrer-Zimpfer also felt the same way as Daniel and indicated that although she has been going there for years, she’ll never stop going there. Prescriptions Plus Pharmacy offers customers coupon codes which they can use to get discounts when purchasing medications online thus, customers who use the Prescriptions Plus Pharmacy website not only have access to high-quality medications but lower prices as well. The coupon codes for Prescriptions Plus Pharmacy can be found on its website specifically on the “Rx Coupons” section. Buyers who use the website are assured that with the coupon codes offered, they can save as much as 450 US dollars on top brand medications. The steps to get coupon codes from Prescriptions Plus Pharmacy website is also made known to the public. Customers only have to select the medication they want to purchase and then select the dosage. If a coupon code is available for that medication then buyers automatically see the code and can use it when purchasing that medication, however, it is not clearly stated whether or not there are coupon codes for every medication available on the website but customers are assured that new savings coupons are frequently added to the website. While coupon codes are necessary to assist buyers to save cash when purchasing medications, the Prescriptions Plus Pharmacy coupon codes may not be available for all individuals. Individuals with government insured programs including Medicare, Medicaid, Military, VA, State are ineligible to use coupon codes when purchasing from this website. The customers who have purchased from this pharmacy did not indicate that they purchased medication using a coupon code and it is not stated whether buyers who purchase from the local drugstore and not online are eligible to use coupon codes. 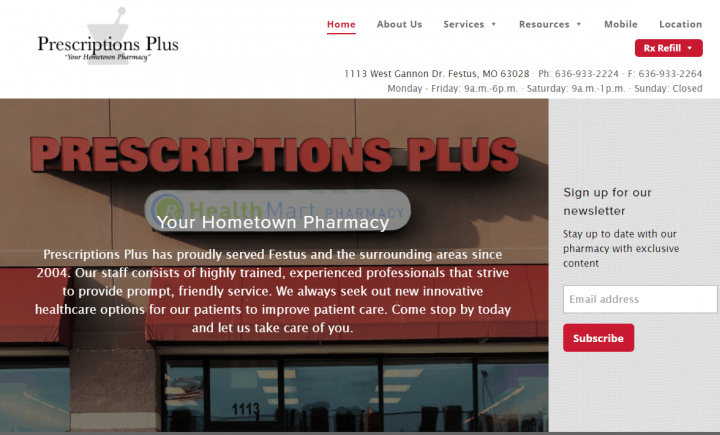 The Prescriptions Plus Pharmacy is renowned for its reliable services that are not only limited to a retail drugstore that serves the Jefferson County but an online website to reach a wider audience. Prescriptions Plus Pharmacy does not only sell medications but buyers may purchase gifts and even get a vaccination. It is owned by reputable pharmacists who have a good number of years of experience and so customers are assured the best of services. Customer reviews for Prescriptions Plus Pharmacy suggest that the services offered by this pharmacy are genuine and that the staff always work hand in hand to ensure that customers receive the best treatment. Customers are also offered coupon codes with which they may save cash while purchasing medications from the website of this pharmacy and these customers do not have to look very far to find these coupons as they are located in the website, however, not all individuals are eligible to use the available coupon codes. Prescriptions Plus Pharmacy may offer reliable services to its customers and while customer reviews are favourable for this pharmacy, there are so many online websites that are illegal and sell counterfeit medications to buyers and with the rapid increase in these fake online pharmacies, it has also become increasingly difficult to find legitimate online pharmaceutical stores that sell genuine medication. To assist buyers to find approved online drugstores to buy genuine medication, we suggest you go through our list of top recommended pharmacies.